When I decided to close my old blog Kitchen Goddess (in training! ), it was because I wanted space to grow and expand. The blog was exclusively about food and had little of my own personality behind it. The move to Southgate last year was the perfect opportunity to start a new blog and it would seem the Supper in the Suburbs one year anniversary flew by so fast I missed it! Whilst this is still primarily a food blog – after all food is my favourite thing in the whole world – I wanted to be able to share more about me through the My Week in Pictures Posts and through a series of posts on crafting. Although lawyers aren’t often the most creative of people, art and creativity has always been a big part of me. I studied art up until GCSE level and I achieved an A*. I even had some of my art work displayed in a couple of exhibitions. But, being the “academic” child that I was, I ditched Art for more serious subjects in pursuit of becoming a lawyer. Even so, I still scrapbook, sew and craft on a regular basis and this is the first creation I am sharing with you – an Autumnal Wreath. Decorating homes at Christmas is a long standing tradition but I love to bring a bit of all seasons into the home and this is easily done with this wreath. It can be hung on a door, at a window, or even laid flat as a centre piece on a table – perhaps with candles inside. The possibilities are endless and it’s really what you make of it. Whilst this is the way I chose to decorate my wreath, it really is just one possible way of doing it. If you dislike the smell of oranges, get rid of the orange slices! If you prefer pine cones to conkers, swap them over too! It really is up to you. I must’ve spent ages googling “Autumn Wreath”, “Fall Wreath“, “Conker Wreath” and other silly phrases looking at different techniques and designs. But in the end I just went with the flow and I’m pretty happy with how it turned out. 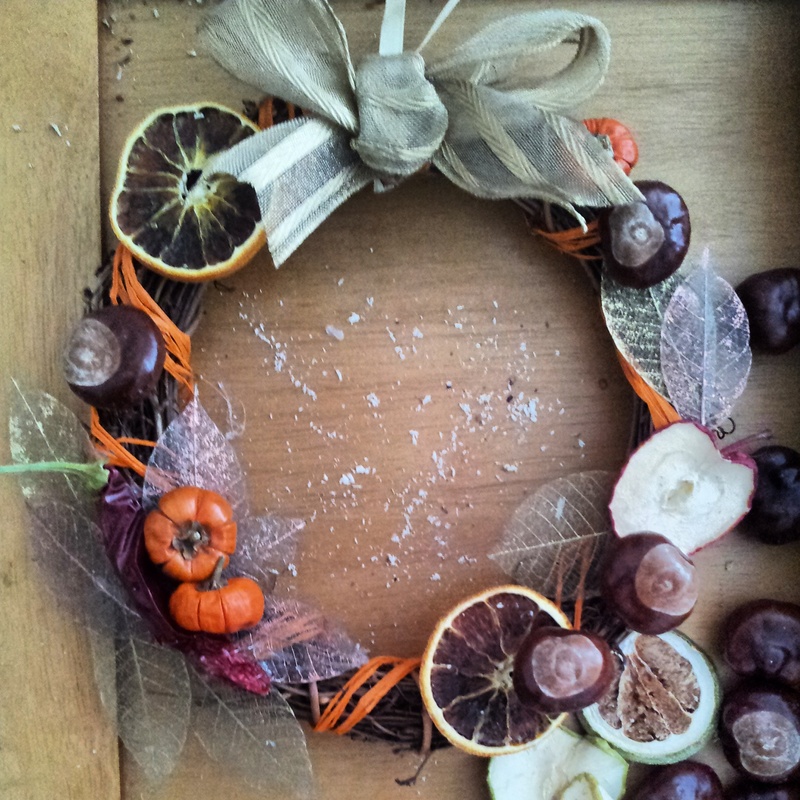 So here we go – how to make an autumn wreath. Step 1: clear a large space and lay your wreath on a flat surface. Chose the “top” of the wreath and take a small strip of ribbon (roughly 6 inches long) and tie around the wreath so that it can easily be hung. Glue the bottom of the loop of ribbon to the underside of the wreath to ensure the ribbon does not slip and slide. Step 2: starting where you have just affixed the ribbon, glue the end of a long piece of raffia, or remaining lengths of ribbon, to the wreath. 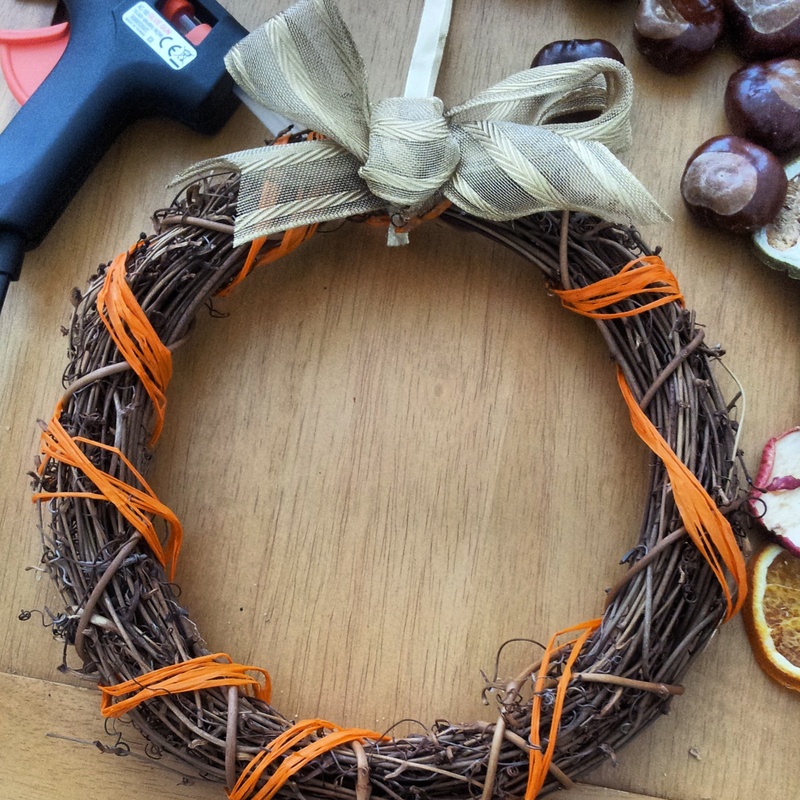 Working in a circle, begin wrapping the rafetta around the wreath creating stripes. Try to keep at least 1.5 inches between “stripe” of ribbon so that it is not too crowded. Once you get to the first end of the rafetta affix with a little more glue. Step 3: with your thickest, shiniest ribbon, create a large bow. Affix this to the wreath to hide where the hanging ribbon and raffia are attached to the wreath. This will also create a central focus on the wreath. Step 4: take your leaves and in the left right hand corner of the wreath create a starburst, with some leaves facing out from the wreath and some into the centre. You can then scatter a few other leaves around the wreath. Using your glue gun, fix these into place. Step 5: focussing on the spray of leaves in the bottom right hand corner, take a large chilli pepper or cinnamon stick (or two) and following the curve of the wreath glue in the middle of the leaves. Don’t forget to leave room for miniature pumpkins! Once the chilli is firmly glue in place, glue two small pumpkins into the curve of the chilli. 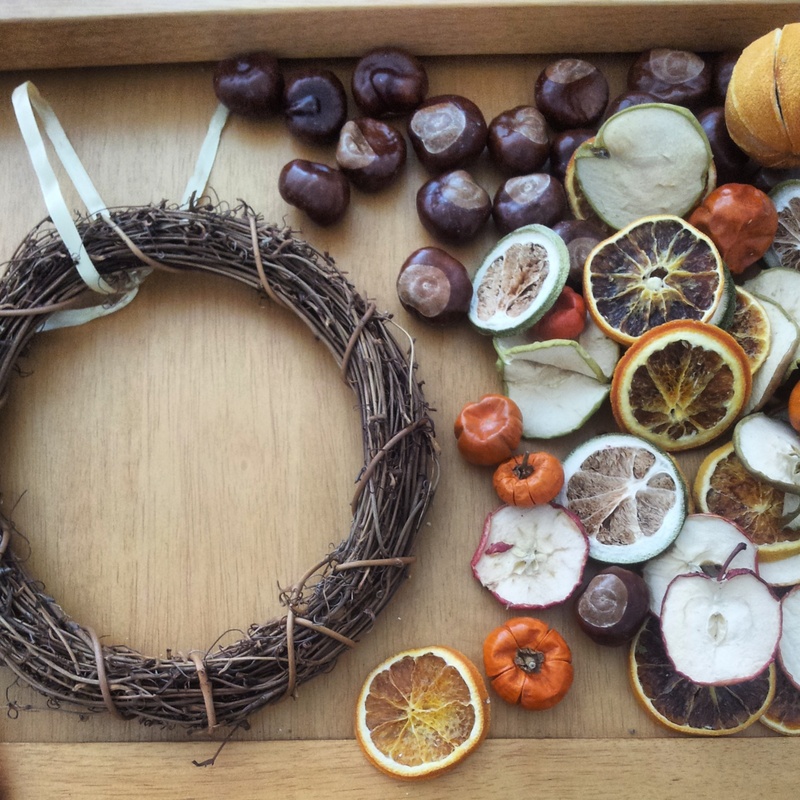 Step 6: Next take the slices of dried fruits (apples, limes and oranges work well here) and choose three of four places around the wreath where you’d like these to go. Once you are happy with their distribution, glue into place. Step 7: Lastly, glue conkers and miniature pumpkins around the fruit slices and leaves. Try to cluster some together and have others spaced far apart. You don’t want it to look too even. For the more visual among you (and I’m guessing if you’re interested in making an Autumn wreath that is probably the case…) here are a couple of my sketches which follow the steps above. Is this the first time you have made/are thinking of making a wreath? Perhaps you’ve made one at Christmas before. I’d love to see any pictures if you have so do leave a link to them in the comments below! This is so gorgeous Emma! Well done! Thanks Kerry! I always get these big ideas in my head so really pleased that it turned out just how I pictured 🙂 I’m doing an even bigger one for Christmas!! !